Did you know that many people are choosing to use essential oils for dealing with GERD and its symptoms? If you experience chronic acid reflux – also known as GERD, then you are well aware of how difficult everyday life can be. We know you’ve spent thousands of dollars on over-the-counter treatments and perhaps even prescription medications. We want you to know that there is relief available. Before we get into that, let’s take a closer look at exactly what GERD is. Gastroesophageal reflux disease, or GERD, is a very common ailment. Gastroesophageal indicates the stomach and the esophagus. Reflux indicates the back-flow of acidic or non-acidic stomach contents into the esophagus. GERD is categorized by symptoms, with or without tissue damage, that arise from constant or extended exposure of the lining of the esophagus to stomach acid. If tissue damage exists, are experiencing esophagitis or erosive GERD. The existence of symptoms with no obvious tissue damage is referred to as non-erosive GERD. GERD is only found when complications become apparent. GERD may cause a number of different signs and symptoms, not all of which may be evident at any given time. Common symptoms of GERD include recurrent heartburn or a burning feeling in your chest or throat, vomiting, sore throat, difficulty swallowing, damaged enamel from stomach acid, chest pain, bad breath, and nausea. Particular symptoms may also be attributed to respiratory complications of GERD, which happen when stomach acid enters your lungs. 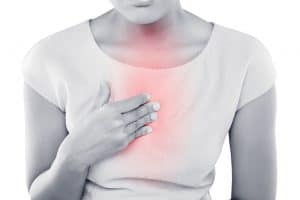 Symptoms of GERD respiratory complications can comprise of asthma, chest congestion, an ongoing dry cough, wheezing, hoarseness or even loss of your voice, laryngitis, pneumonia, or lung infection. If you are experiencing GERD at night, you may suffer from disrupted sleep or additional respiratory complications. If left untreated, GERD can cause painful chronic conditions which can lead to other very serious health concerns. Multiple medications include foaming agents which coat inside your stomach, H2 blockers, or proton pump inhibitors meant to reduce acid production, and antacids to stomach acid. Though GERD can be quite painful, many sufferers are hesitant to take traditional pharmaceuticals for fear of common side effects. In extreme cases, some people turn to surgery which can result in complications with swallowing, bloating, and even internal bleeding. Natural plant-based remedies have been utilized for gastrointestinal discomfort for centuries. GERD can be a warning that much worse underlying health concerns are present. Should this be the case, it is highly recommended that you see your doctor to determine whether or not you’re suffering from GERD or that your symptoms are not indicating a much more looming diagnosis. Once you’ve figured out that you are suffering from common GERD, then you have the power to take your health into your own hands. Many GERD sufferers have testified how natural remedies, such as essential oils, reduce their symptoms to the level where medication is no longer required. Essential oils for GERD can offer an all-natural solution for your pain and discomfort attributed to GERD. When administering essential oils for GERD, it is crucial to locate an appropriate carrier oil which meshes well with your skin’s chemistry. Consider your skin type. Different skin types absorb oils differently and some do not react well to certain oils at all. Take a small portion and rub it on your forearm, wait roughly 30 minutes, and see how your skin reacts. If you find yourself not reacting well, try a different oil and repeat the process. Once you’ve discovered the right oil for you, you are able to proceed with the healing benefits of the topical application. Several oils are available, but the ones most recommended are coconut oil, jojoba oil, hemp seed oil, and olive oil. Combining essential oils with the proper carrier oil will dilute the potency, reduce the chance of irritation, and allow you the ability to experience this natural remedy at its finest. Organic lavender oil can help soothe your symptoms related to GERD, but it can also be a great source of stress reduction as well. Often GERD and its accompanying symptoms are brought on, or at least exacerbated, from stress. Lavender was a popular plant utilized in ancient Egypt and throughout the Roman culture. Its acceptance as a natural remedy is just as solid today as it was thousands of years ago. Lavender oil is very mild on the skin and often chosen as a natural fragrance for perfume, skin care, and beauty products. It is also recognized for its comforting properties and administered as an agent to promote better sleep. Lavender is known to relieve stress, insomnia, depression, and restlessness. Lavender is also accepted as an anti-inflammatory and antiseptic, making it beneficial for burns, cuts, and bruises. Many people who suffer from GERD are concerned about ensuing discomfort from eating and therefore find themselves suffering from stress and anxiety when they around food. Stress can contribute to a lack of blood flow and oxygen to the stomach producing cramps and inflammation of the stomach wall. Lavender has been shown to be just as effective in reducing stress and anxiety as much as some leading Western medications. For those of us suffering from GERD, lavender’s soothing properties can ease overall anxiety. When applied topically, lavender is a terrific essential oil for GERD. Mix a few drops of Lavender with the carrier oil of your choice and rub on your stomach and chest to relieve the pain of cramps and bloating. Spraying your pillows and sheets with lavender diluted with water can bring about a restful night sleep. Always use a therapeutic grade essential oil anytime you choose to ingest it. A therapeutic-grade will be more stable and less likely to harm the lining of your esophagus or stomach. 1-2 drops at the back of your tongue can provide fast relief. Or, add a few drops to a cup of hot water or herbal tea to sip slowly after meals, helping to ease digestion. Many of us who suffer from GERD are hesitant to eat because of the inevitable discomfort it brings. Unfortunately, not eating enough brings on a host of other issues including bad mood, being tired, and having a short fuse. Studies have shown organic essential lemon oil has the ability to encourage a healthy appetite. Lemon oil is acknowledged for its calming effects while encouraging concentration, alertness, and hunger. It is a useful tool to battle anxiety and stress. GERD can cause a thinning of the mucus layer in the stomach and esophagus. Over time, this lack of protective coating can lead to irritating ulcers. 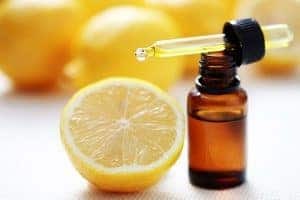 Lemon oil encourages the production of mucus, which assists in the soothing of the lining in the esophagus and stomach and helping to reduce the likelihood of developing ulcers in the future. Other than the benefit of mucus production, the next best thing lemon has going for it is its invigorating smell. Feel free to add it to water and spray your entire house, use it as an effective cleaning aid, and even add it to your favorite hot tea and sip it before meals. If you like, it makes an effective topical agent as well. Just be sure to dilute its potency with your preferred carrier oil, then rub it across the chest and stomach. 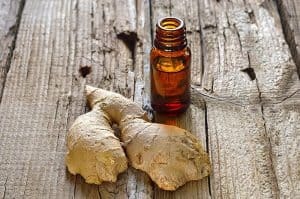 Ginger is a long-standing essential oil that has been used to aid in digestion. In the Far East, it has been relied upon for centuries to ease discomfort associated with GERD and its symptoms. It can be added to a diffuser and as a topical solution. But it is through ingestion when ginger really is able to help with GERD. Ginger is a well-known essential oil for acid reflux, nausea, menstrual pain, morning sickness, and bloating. GERD may cause swelling and discomfort of the esophagus. Periodically, this can lead to tears of the lining that protects the esophagus and stomach. Ginger reduces swelling while also promoting the increase of digestive fluids. Ginger is a great spice to add to any meal. You can grate it raw in your soups or hot beverages, make ginger candy chews, or bake it into pieces of bread. Many people who want to experience quick relief use ginger essential oil to treat their GERD. Mix 2-3 drops of ginger essential oil to a hot beverage or put a few drops at the back of your tongue. Like lemon, organic peppermint oil is another aromatic scent which is stimulating and refreshing. Peppermint originated in the Mediterranean and continues to grow wild in moist climates all throughout Europe and North America. It is used in so many common products, such as teas, toothpaste, gels, creams, and more. It is highly versatile and highly sought after. Recognized for its antibacterial characteristics, peppermint is often added to salves and gels to promote healing. It is also accredited for its capacity to lessen gas and bloating. 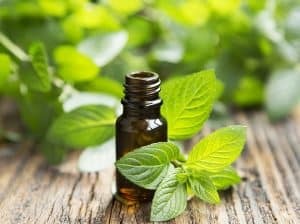 Bad breath can become lingering, so many sufferers choose peppermint essential oil for their GERD. A few drops on the back of tongue can help reduce gas and bad breath. Peppermint may also assist with tension headaches that often accompany GERD. A few drops of peppermint oil in a diffuser will enhance any space. Spray your bedding to rid for a comfortable space for you to rest! Add a few drops to a warm beverage to sip slowly before meals and after meals. Adding a few drops of peppermint oil to your favorite carrier oil can help to soothe an irritated and bloated belly and chest. Eucalyptus is a powerful essential oil that has shown to be beneficial in the treatment of GERD and its symptoms. This essential oil contains most of the characteristics of traditional volatile oil. It is found from the fresh leaves of the eucalyptus tree. Like other essential oils, this potent oil can be ingested or administered topically. It is especially effective when used topically in conjunction with your favorite carrier oil. Add a few drops of eucalyptus essential oil to your preferred carrier oil and massage the affected area. Feel free to add a drop or two of peppermint to complement the relief. 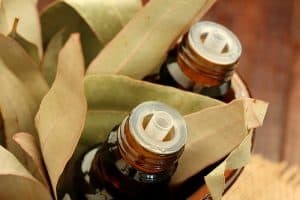 Since eucalyptus oil is quite volatile, it is best to seek the advice of a healthcare professional before choosing to ingest it. It does have therapeutic properties that help with the accumulation of digestive enzymes but, because of its potency you should be wary, and it’s best used as a topical agent. Should you and your healthcare professional decide you should ingest a drop or two, you can add it to hot water or tea. Always use therapeutic grade Eucalyptus essential oil if you are going to ingest it. While there may not be the best essential oil for GERD for everyone, there is certainly a best essential oil for your GERD. Each essential oil provides various effects that can help relieve your symptoms. You’ve agonized far too long with GERD to not do anything about. Or, if you believe you’ve done everything you could, perhaps it’s time to do something different. If you are tired of constantly treating your GERD with antacids and chalky concoctions, we believe that essential oils may be the all-natural solution you’ve been waiting for. Essential oils for acid reflux possess the ability to offer you the relief you deserve. 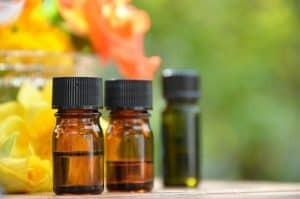 Throughout human civilization, essential oils have been depended on to care for numerous ailments, including GERD, acid reflux, heartburn, bloating, and other gastrointestinal problems. Although gaining in popularity, essential oils are not new. They are a tried and true method that can be exactly what you need in your time of suffering. We encourage you to take it seriously and give your body the chance to experience its benefits and finally find much-needed relief.